Brussels sprouts aren’t ever likely to make the vegetable Top Ten list, but they are beautiful, relatively carefree plants, and if you’ve eaten only store-bought sprouts you don’t know what you’re missing. It’s actually the same species as broccoli and cabbage, but over the few hundred years it’s been in cultivation, growers have selected plants that sprouted readily at the leaf joints, called axils, instead of heading up at the terminal bud like cabbage, and saved the seed from those. If you’ve ever harvested a tall cabbage and then been pleasantly surprised to find a ring of little heads sprouting from the bare stalk a few weeks later you’ll understand how this important characteristic was discovered. We put Brussels sprouts in the first year of our rotation, when nutrient levels are at their highest. Also, since the soil-borne diseases to which all brassicas are susceptible are able to survive long periods in the soil, we want to keep all the brassicas in the same part of the rotation, so that the time between repeated plantings in the same plot is maximized. 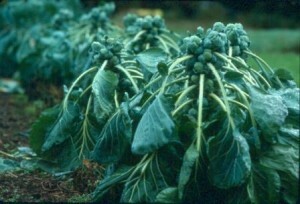 The seedlings should be started two weeks later than the other spring-planted brassicas – only four to six weeks before the last frost – and set out once the weather has settled. We use # 50 plug trays to give them plenty of room to grow. If you are keeping the trays outside and there is a lot of insect pressure, it pays to cover the trays with a row cover. Each plant should be allotted four square feet of bed space to prosper: if you are planting in beds, set the plants two feet apart each way; in rows they can be a foot-and-a-half apart in the row, with the rows three feet apart. With good fertility they’ll fill the space. We plant a single row down the center of a thirty-inch-wide bed and grow a quick crop of spinach along the edges; the spinach is up and gone long before the sprouts need the space. Once the plants are up and growing, their major enemies are cabbageworms and harlequin bugs. The first are pale green caterpillars, 1 to 1 1/2 inches long, that eat everything cabbagelike in sight, including Brussels sprouts. They are the larvae of a number of related species of moths, and the most effective modern control is Bacillus thuringiensis, or Bt (see below). Harlequin bugs are brightly colored, and also feed on the foliage; hand picking eggs and adults is the best control. Probably the most effective method of controlling these pests is by the use of what old-time organic gardeners call “bug spray,” an unappetizing concoction that uses statistics the way they ought to be used. This is essentially the same technique as using Bt, but it is home-made, and free. Here’s how to make it. Once the caterpillars appear, find a few that look abnormal or that seem more sluggish than the others (what you are after is sick or parasitized individuals), plus a dozen or so normal ones. If you can’t find any sick ones gather three or four dozen total, the more the better. Now here’s the revolting part: take the caterpillars and put them in an old blender with a cup of tepid water and make bug soup. The water should not be chlorinated; if you are part of a community water system, use water from a pond, stream, or mud puddle. If you don’t have a blender you’re willing to sacrifice for this purpose, you can crush the caterpillars by hand or with a mortar and pestle. 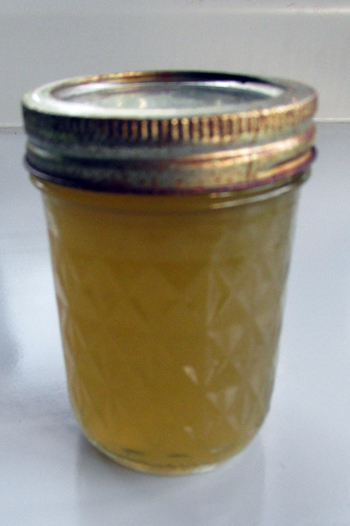 Add another cup of tepid water, pour the “soup” into a canning jar and set it in a warm place, say the laundry room, for a couple of days. Then take the contents of the jar, dilute with a further amount of water appropriate to the size of your garden, and put it in a garden sprayer, straining it if necessary. Use this spray to thoroughly coat the leaves of the plants affected. With any luck, the majority of the caterpillars will soon sicken and die. Why should this work? Because you have “cultured” — using a kitchen-table form of genetic engineering — whatever disease or parasite the sick and dying caterpillars you selected had, and then spread it all over the food supply of the remaining caterpillars. The reason for getting a large number of individuals if none of them look sick is that it is statistically likely that some of them were ill, but just not showing the symptoms. Any parent of school age children will recognize this process immediately! By giving the existing disease good conditions to spread — warm, unsterilized water with crushed caterpillar bodies in it — you helped along a thoroughly natural process, and that is the essence of organic gardening. The principle involved here is simple, and applicable to any number of garden pests, as long as you can catch them at the feeding stage. If this method is too down-and-dirty for you, though, there are commercially prepared biological pesticides available. Bacillus thuringiensis (Bt) is a naturally occurring bacterium that infects, and eventually kills, a wide range of soft-bodied caterpillars. It is harmless to other kinds of animals, including people (but also to adults of the same species as the caterpillars, which means that timing of applications is critical). If you use this spray, which is sold under a number of trade names such as Dipel or Thuricide, you need to begin spraying within a few days after the butterflies appear, and repeat the sprays every week or two while the butterflies are around, to make sure that none of the eggs hatch onto untreated leaves. Once the caterpillars catch the Bt infection they stop eating, but it takes three or four days for them to die. 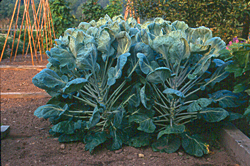 There are several seed-borne diseases of the whole cabbage family that affect Brussels sprouts, but if you buy quality seed from a reputable seed house they won’t concern you. Club root, however, is a soil-borne fungus that can be brought into your garden on the roots of purchased transplants, or with a load of manure from livestock that fed on infected plants, or even on the soles of your shoes. Its first symptom is wilted plants in the heat of the day that recover overnight. Pull one of the affected plants and look at the roots; the deformity associated with this disease will quickly explain its name! The best way to avoid a repeat (if you do see the symptoms) is to destroy any infected plants and keep all brassica family crops out of that area for at least four years. Seven years is better, though impractical for home gardeners. You can help prevent club root with an application of wood ash around the base of the plants, as that will raise the pH of the soil beyond the range that supports the fungus. For this use, mix the wood ash into the soil instead of just dusting it on the surface. Harvest will be in late fall, and there isn’t much point in trying to rush the season as the sprouts shouldn’t be harvested until after the first fall frosts have sweetened them up. That’s why store-bought sprouts don’t taste as good: 90 percent of them are grown along the California coast just north of Santa Cruz, where the weather is cool year-round but rarely frosty; that makes for very productive plants, but bland flavor. Good Brussels Sprouts are not easy to grow in the humid south, as they need to be started about 8 weeks before the weather begins to cool down, and that is often a period of high temperatures, humid drought and intense insect pressure. Crops should be kept under a very light floating row cover to exclude insects without raising the temperature any more than absolutely necessary. Brussels sprouts can be harvested anytime after the sprouts begin to form, but the flavor and vitamin content both improve if you wait until at least the second significant frost. Though they are rich in vitamin C to start with, their content of this important nutrient is highest if the sprouts are harvested when the temperature is at or slightly below freezing. Brussels sprouts mature from the bottom of the plant to the top because the top, or apical bud (the plant’s growing point) produces a sprout-inhibiting hormone; the farther from the apical bud a given sprout is, the weaker that hormone is. As the plant grows taller, the lower sprouts begin to form, and when it reaches its mature height production of the hormone stops and sprout formation proceeds up the stalk. Brussels sprouts plant with the apical bud removed. This gradual maturation is fine if you want to harvest your sprouts a few at a time, over a long period; but if you want a concentrated harvest you should cut off the apical bud to stop production of the hormone earlier than would happen normally. This will change the plant’s hormonal balance and allow all of the sprouts to ripen at once. Timing is important for this “topping,” though. If you take out the apical bud too soon, the sprouts may mature before frost has had a chance to enrich their flavor; if you wait too long, the lower sprouts may become over-mature. A good rule of thumb is to top the plants six to eight weeks before your intended harvest date. If the plants have already been topped, and the sprouts are just about ready, you can simply cut them off a few inches below the lowest good sprouts, remove any remaining leaves, and put the resulting “sprout logs” in the root cellar. Sometimes farmers even take them to market like this and sell them to knowledgeable cooks by the piece. If a really hard frost threatens (temperatures below 25F/42C), you can pull up the plants, with a generous soil ball, and put them in a more protected place. A shed or cold frame should be enough, but you could put them right on the dirt floor of a root cellar, and they’ll continue to ripen for a few weeks. There is one really unique kind of Brussels Sprouts you should try if you manage to get the seed, and that is a purple Brussels Sprout. 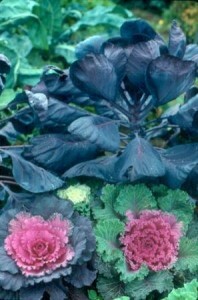 Not only do they taste good, but they are spectacular ornamental plants, and combine well with the various kinds of ornamental kale to create a striking — and edible fall border! The only two varieties I have ever seen are called Rubine and Falstaff.